I´ve made some more new pieces of my (mostly in germany) well-known expansions. If you´re interested, please find all informations below (end of this post)! 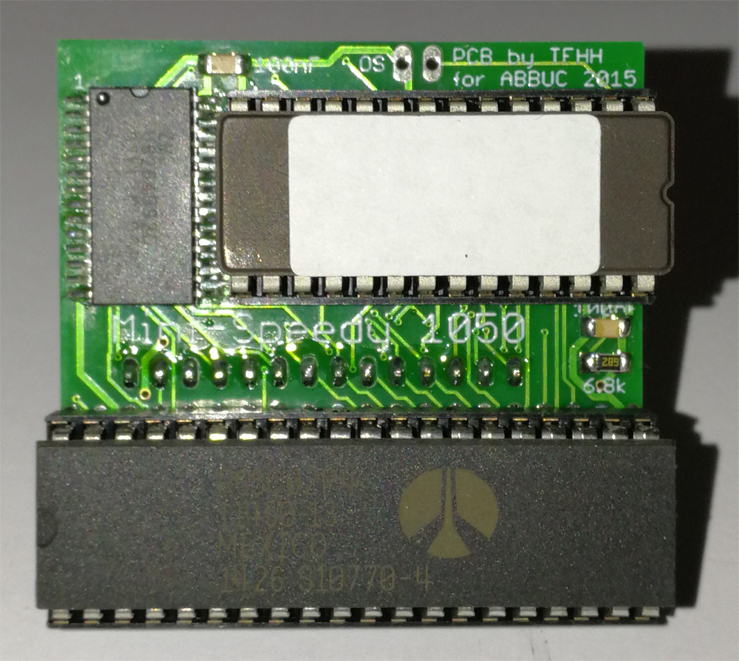 This small PCB (only 5 x 5 cm) enables your Atari XL/XE to watch the newest demos or play the actual homebrew games which requires often more than the 64 KB main memory of the machine. My solution don´t need the drill holes for switches, it´s software configured. After power on, the 512 KB "RAMBO" mode is active. This mode should fit all your needs in 99% of all use cases. For some rare programs you can switch to 256 KB Compy-Shop mode (with seperated ANTIC and CPU access) or switch the whole expansion off. These setting remains active until you power off the computer, a coldstart without power cycling won´t change the setting anyway. The ANTIC needs to desoldered, if it´s not already in a socket. Also the MMU. Just three wires must be soldered, a prepared cable for that is included. 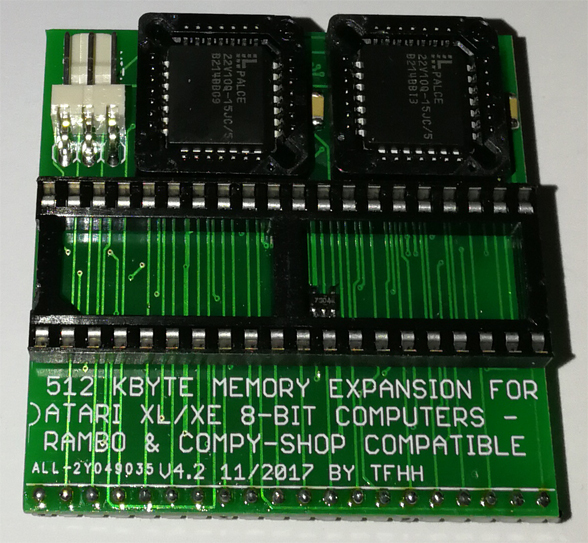 This SRAM based 512 KB memory expansion works in all Atari XL, XE and XEGS computers. This small PCB sizes only 5 x 5 cm and it´s installation is absolute solderfree. Just remove two chips, cut of four capacitors and plug in the Mini-Speedy 1050 PCB - that´s all! 5. Built-in (just boot your 1050 with open disk lever!) Highspeed-Copy-Program or BiboDOS (needs seperate switch for changing Speedy O.S. selection). The Turbo 1050, made by B. Engl, is one of the "freakiest" products I know. 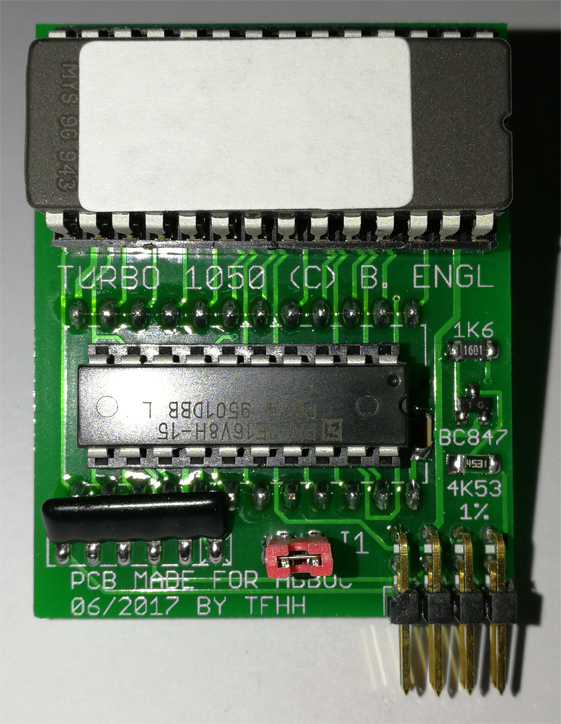 Just using an EPROM, a GAL (logic chip) and some parts around the Turbo 1050 is a very cool floppy enhancement for the Atari 1050 diskdrive. The power is in the software only! No track buffer, no additional RAM, no CPU with bigger address space. On the other hand, Turbo 1050 can copy more protected games like any Happy 1050! Due to the fact that the Turbo 1050 hasn´t any track buffer the Highspeed-SIO is always used, but really effective only when the disk to be used was formatted using the Turbo 1050. The Turbo 1050 formats disks with a special interleaving, so that these disks can be read at the same speed like all other floppy enhancements with track buffer. This "catalogue" also includes my other solutions. These hardware extensions are highly recommended! Just upgraded two of my 800XL Ataris with the 512k SRAM extension a few months ago and they are worth every (Euro, US, CA, ...) cent ! The SRAM extension without any switches has 576k RAM always available and unlike the U1MB in 576k mode, it has both Compyshop and Rambo banks available in this mode, so any software that requires either Rambo or CS will work in this mode. Only programs that do require sep. Antic will NOT work in this mode, but as you can read in another topic here at AA there are only 7 programs atm that really require sep. Antic mode. But for sep. Antic mode you can simply switch down to 256k CS only mode and if you ever stumble upon a program that does not work with port-B XRAM present (have not found one in the last 20 years) you can also switch off the extension. A long long time ago I released a list with programs that require XRAM and also noted what keys one has to press to reach the setup or config. of this program to configure either a Rambo or CS type enhancment - well, you no longer have to press any key (nor go to the setup/config), in 576k mode it is no longer nescessary to configure any demos, games or tools/applications, they just take the RAM/XRAM they need and work fine ! Edited by CharlieChaplin, Sat Mar 31, 2018 10:07 AM. Could you add estimated P&P price? Does the 512KB SRAM board replace the built in memory? i.e. if installed in a stock 600xl, would it now have the full 64K base memory, or would a separate 64K mod be needed also? I've had a chance to try tf_hh's Mini-Speedy and Turbo-1050 replicas for a few months now, they're really fantastic products! For those that missed out on the 1050 Mega-Speedy production, or just want simple mods without so much external visibility, the 1050 Mini-Speedy, and 1050 Turbo are really neat re-creations from the past to experience. Here's some of my observations of these upgrades, from someone who has never seen them 'in action' until recently. The Speedy ROM's were previously incompatible with NTSC machines all these years until it was patched by Hias in early 2017 as part of the Mega-Speedy project, and that updated '1.7' ROM is used in this Mini-Speedy as well, so it's a very simple 1-plug upgrade and 4 resistors to remove (which will benefit any upgrade). So, as a north-american user, this upgrade is new to me, and I expect many others. The firmware designers were really smart and took the Happy-type track buffer to the next level by buffering reads and writes to the DOS 2 VTOC and directory sectors (360-368), as well as the Enhanced density VTOC at sector 1024. Once these sectors have been read once, the drive will never spin up to read the DOS 2 directory. And to take it further, it will buffer writes to these tracks until AFTER all other IO is done. So if you copy 20 small files to a DOS 2 disk, the head does not have to keep seeking back to the VTOC/Directory before/after each file. They are written quickly and sequentially, and then when DOS is finished, you see the drive seek back to the directory and flush the writes to the VTOC/Directory all at once. Very ingenuitive! Theres lots more to say about this upgrade with the additional utilities too.. Turbo 1050 is an interesting beast. This is the fabled upgrade for 1050's that provides true double density with NO ADDITIONAL RAM, and also seems to work great with NTSC machines. Always thought theoretically possible, since the 6532 RIOT has 128 bytes (traditionally used for the stack) and an additional 128 bytes in the 6810 used for the sector buffer. By using only a ginormous 32K bank select ROM and GAL, they were able to facilitate double density. As tf_hh already mentioned, it also provides 70000bps SIO rate (compared to happy/USD standard of 54000bps) but with no track buffer, increased speed requires modified disk skew format. My tests so far seem to show the physical skew is the same as a disk formatted by US Doubler, but there might be improved skews available in utilities i haven't touched yet. RWTEST.COM is giving me almost identical results comparing the two upgrades, using disks formatted in either drive. Also interesting to note is the Turbo 1050 high-speed protocol is incompatible with the US-Doubler type standard also used by Happy, Super Archiver, Speedy, etc but it has a self-booting high-speed patch if you turn on the computer without a disk in the drive first. Hias high-speed patch also supports this protocol. That's a very creative feature! The same protocol appears to be used for TOMS type drives from Poland. Makes it a little more difficult to use in high-speed with some disk utilities and DOS's. No, the 600XL must have 64 KB already to be fully used. Didn't read first page... Thanks. Edited by lemiel, Sun Apr 1, 2018 4:21 AM. Afaik, in the past the Turbo 1050 was much cheaper than the Speedy and also offered the printer interface. But nowadays ?!? Think the Speedy beats the Turbo almost everywhere, there are many more tools for the Speedy and errrm, there is even a Turbo 1050 emulator for the Speedy available (made by P.Sabath). The Speedy only needs a driver (or driver-software) for ultraspeed, this can be in the OS, the DOS, the Gamedos or whatever. The Turbo however needs a driver (from the drive itself or from software / hardware like OS, DOS, Gamedos, etc.) and the special format (sector skewing / sector interleave) for Turbo Speed. There is much less software (incl. drivers) for the Turbo available than for Speedy (or generally ultraspeed drives). Sounds great! I'll be ordering the 512K upgrade soon! Brenski told me about them when he was having trouble upgrading a Rambo re-image to 512K. I want one for my 2nd 1200XL, my number one has a PBI port, so I use Syscheck 2.2 512K for it if I need more than 256K Rambo. I prefer these over U1MB because I can still have 32-in-1 OS. I upgraded the 600xl to 64Kb in 15 minutes (once you wait for the memory chips to arrive from China). There is a version of the upgrade with 3 little cable bridges and just 4 soldering points to do. Which are 5 pieces so you use 2 and save 3 as spares. I also used 2 of those spares to "transform" my old 65xe in a 130xe. Now I want MORE. So I'll probably be getting this 512Kb sram expansion. Edited by manterola, Sun Apr 1, 2018 11:26 AM. Is anyone else having trouble opening the PDF file? Of course using floppies, or even the whole A8 in 2018 can be considered impractical in 2018. But yes, a Happy or Speedy is simply much better for day to day use because it is 'always fast'. If you were lucky enough to get a MegaSpeedy while they were available, it has Speedy and Turbo 1050 modes anyway. These are nice cheap boards that are currently available. They may also be interesting to north american folk like me that never saw these upgrades in action back in the day. Minimal upgrades like the Turbo 1050 and US Doubler are 'interesting' to me becausethey don't have a track buffer, and rely on custom sector skewing schemes. I feel like every 1050 should be upgraded with at minimum a US Doubler since they're easy to replicate and cheap, and these upgrades present a few more cheap and easy to install options for people that want to do the same. Edited by Nezgar, Sun Apr 1, 2018 2:58 PM. Just downloaded it -- no issues. Win7 + Chrome. Maybe your Anti-virus? They are getting pickier and pickier about what they will allow. I can download it, but when I view it it's blank. Apparently work was a different matter, downloaded now! sorry for that - orpheuswaking also report problems. I´ve add an alternative address (see post #1 of this thread) for download, it´s the GMX media space. The website is - sorry - in german only, but it´s easy... just click the file(s) and select "Herunterladen" (german for "Download"). Ah so, Prima. Das geht, danke schon. Edited by danwinslow, Mon Apr 2, 2018 8:22 PM. PDF works perfectly fine for me. Firefox, Windows XP32, Acrobat Pro XI.